Here's an article that appeared October 4 in the Ventura County Star. Good information on drought-tolerant landscaping. 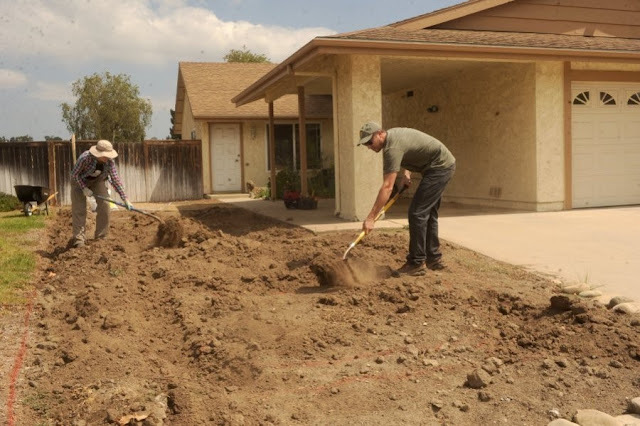 ROB VARELA/THE STAR Jon Szczepanek (right) and Laura Maher, founders of Eco Restoration Partners, dig up the front yard and create a bioswale system at a home in Camarillo. 9/3/15 Camarillo, Calif.
"Mow, blow and go" is still the order of business for most lawn-maintenance companies, but as more grass is being replaced with drought-tolerant plants, the landscape and the tasks needed to maintain them are changing. Shrubs need pruning and ever-present weeds need pulling. More of these types of duties could actually increase the time a gardener is on site, while new designs that effectively catch rainwater runoff could reduce the need for sprinkler irrigation. 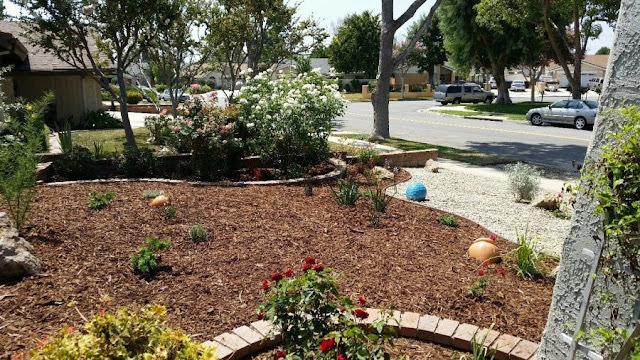 "Re-educating homeowners and landscape companies about bioswales, rain gardens and gray-water irrigation is what we are trying to do," said Laura Maher, 40, co-founder of Eco Restoration Partners in Camarillo. "We take a watershed-wise approach to the topography and grading of the house. Normally homes are graded to push the water away, so the water doesn't damage the home. However the concept of slowing, sinking and spreading of rain water is what we are trying to achieve, so you don't need outside irrigation if you design and plant right." 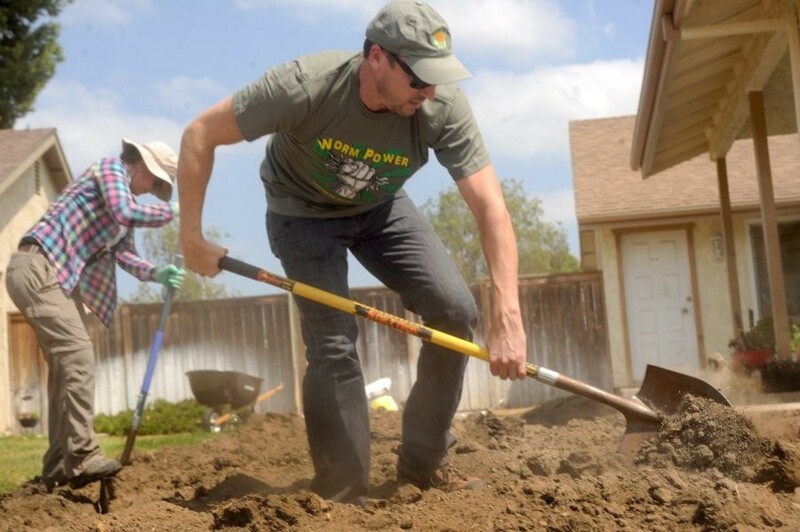 PHOTO BY ROB VARELA, THE STAR | Laura Maher (left) and Jon Szczepanek, founders of Eco Restoration Partners, dig up the front yard and create a bioswale system at a home in Camarillo. It's not exclusively about planting cactus, a living symbol of drought tolerance. Shrubs such as devil's trumpet (botanical name: datura) and Brazilian sky flower (botanical name: duranta) are popular and drought tolerant. "People think drought tolerant and imagine the Arizona desert, but that is not the case," said Michelle Solties, 53, owner of Premier Tree and Landscape in Simi Valley. "We use flowering shrubs like kangaroo paw and feather cassia, and cover like blonde ambition grass. To learn even more, BeWaterWise.com offers information on drought-tolerant landscaping and using less water." According to a report from the State Water Resources Control Board released in late August, California cities are cutting their water use. Cities cut water use by a combined 31 percent in July, exceeding the governor's statewide mandate of 25 percent. Knowing how and when to water is crucial. For example, a drip line that outputs one-gallon of water per hour is often used for shrubs. "But if the shrub requires 15 gallons of water, and you run the drip line for 15 minutes, you are only giving the shrub a quart of water," said Carl Brodock, 52, nursery manager for Elegant Gardens Nursery, a wholesale grower founded in 1999 that utilizes 25 acres in Moorpark. "You need to run that drip line for 15 hours. Then you might not need to water again for two weeks." Lawns can greatly benefit from a similar watering pattern. Fescue grass lawns, which many people in Ventura County have, can set roots 3 feet deep. Saturating the soil to a depth of 3 feet means the lawn can go 10 days or more without watering. Products such as Turf Rescue made by Agromin in Oxnard can also help homeowners use less water on their lawns. Turf Rescue is a blend of Cool Planet's CoolTerra biochar and Agromin's Compost 100 organic soil that keeps lawns green while using a reported 35 percent less water. Biochar is a highly porous charcoal-like material that improves moisture and nutrient retention in soil. "Turf Rescue helps your lawn retain water and nutrients," said Mike Zwerner, in sales and marketing for Agromin. "Whatever type of grass you have — fescue or St. Augustine crab grass — will stay greener with less water. Your lawn service can help you put down Turf Rescue, because first you need to aerate your lawn and then spread out Turf Rescue." Premier Tree and Landscape brings an English garden look to a Simi Valley home. Explaining how roots work and how to irrigate effectively is important to the success of Maher's and Solties' services. Because there are ways to help your lawn thrive with less water, hastily ripping out plants and starting fresh may be a mistake, because drought-tolerant plants may already been on your property. "We work with the plants already thriving, and also find native plants that coexist, and then use wood chips and gravel to create pathways to nowhere," Solties said. "In order to break up the yard we put in a pathway that ends at the side of the house or at a wall. We may design the yard into quadrants and use the paths to make it more interesting." Taking rainwater off roofs, driveways and streets and channeling it into bioswales and rain gardens not only helps use rain more efficiently and keep it from simply draining into the ocean, but it also filters out pollutants that could cause harm to living things. "A 1,000-square-foot roof can capture 600 gallons from one inch of rain," Maher said. "So the home rain gutter is a key component to passive or active water capture. Bioswales, earth gutters and rain gardens filter the silt and pollutants from surface runoff, and then vegetation is planted on the side. Those roots tie into the swale and live off the water." Maher said 2015 is the International Year of Soils, and that soil is the most undervalued resource on the planet. "Our air has too much carbon and our ocean acidification is related to too much carbon," Maher said. "Yet our soil is carbon starved, so connecting the dots with these three elements and using that bioswale to filter pollution means the answer to climate change is under our feet."